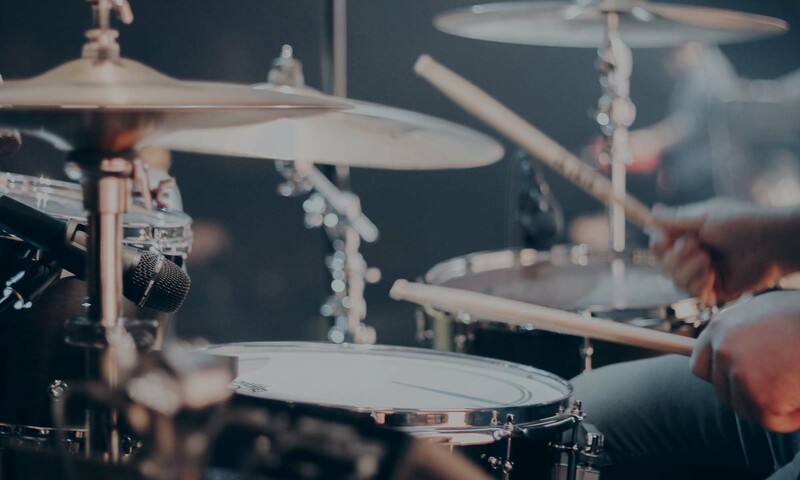 Although humans have been hitting things with sticks to make noises for around 165,000 years, the drum kit as we know it is a relatively recent invention. The first recognisable ‘drum kit’ appeared less than 100 years ago! Let’s have a look at the parts of a drum kit. Thank you so much for visiting BeginnerDrums.uk – a site dedicated to helping you get started on the drums. 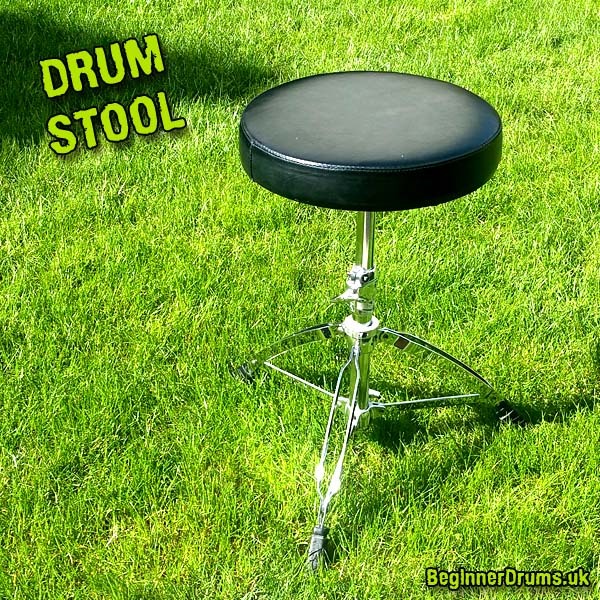 There’s hundreds of free exercises, guides and videos on this web site to help you learn how to play the drums so have a good look around! How many pieces? What is a 5-piece drum kit? A drum kit is commonly described by the number of pieces it consists of. To work out how many ‘piece’ drum kit you have simply add up all the drums, ignoring cymbals and other hardware. Another method is to count the toms and then add 2 (for the snare and bass drum). So if your drum kit has 5 toms then it’s likely to be a 7 piece kit (assuming it has one snare drum and one bass drum). If a kit has one bass drum, one snare drum and one tom then it’s a 3 piece kit. The most common configuration is a 5 piece kit consisting of a bass drum, snare drum and 3 toms (high, mid and low) – and then of course you also have the hi-hats, cymbals etc. but these don’t count towards the number of ‘pieces’. You could have a 5 piece kit with 100 cymbals – it’s still a 5 piece kit. The Bass Drum is the largest of all the drums and also commonly gets referred to as the ‘Kick Drum’ or just ‘Kick’. In a soundcheck you might get asked “Just play the kick please!” – at that point you would play steady hits of the bass drum at a ‘normal’ volume level. The bass drum is played using a foot pedal that attaches to the rim (hoop) of the drum. Sometimes the front head of the drum (the resonant head) will have a hole in it – this can be used to alter the tone of the drum and is also commonly used to mic the drum up. Sometimes the resonant head is removed completely, again to alter the tone of the drum. It’s common to place a pillow or some other damping material inside a bass drum to control the resonance of the drum and also help reduce the volume level of the drum. The bass drum has feet at the front (resonant head side) – these are known as ‘spurs’ and are generally angled in such a way as to minimise any movement of the drum while playing it. 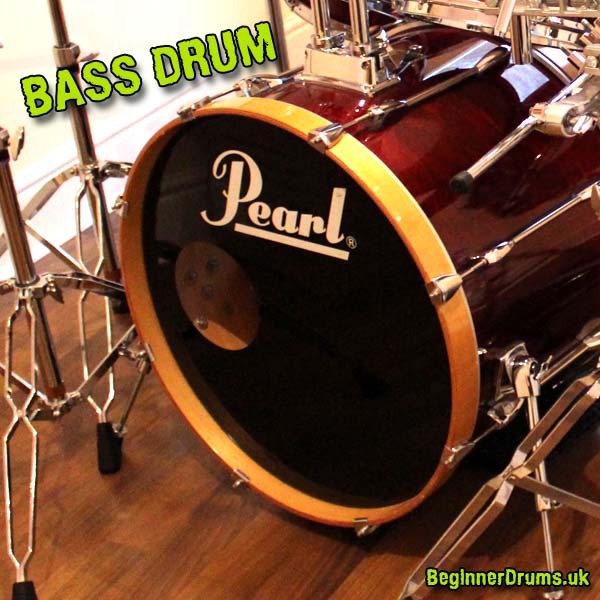 Some drummers like to have more than one bass drum so they can use both feet to play faster rhythms – an alternative to lugging around two bass drums is to use a double bass drum pedal (sometimes called a double kick pedal) – this allows you to use both feet to hit a single bass drum. Although double bass drum playing is probably most common on the metal scene, double bass drum pedals are used extensively in a wide range of musical styles from jazz fusion to funk and pop. Bass drums are available in a wide range of sizes, the most common being 20″ or 22″ in diameter (drums are generally measured in inches as opposed to metric measurements). The stool that you sit on is known as a ‘drum throne’. It’s typically a round padded stool with 3 chrome legs. The height of the throne is really down to personal preference but normally you should ensure you can put your feet flat on the floor and your thighs should be sloping downwards slightly. The hi-hat cymbals are a pair of cymbals that close against each other using a foot operated pedal. Hi-hat cymbals are typically 14″ in diameter but are available in a range of other sizes. 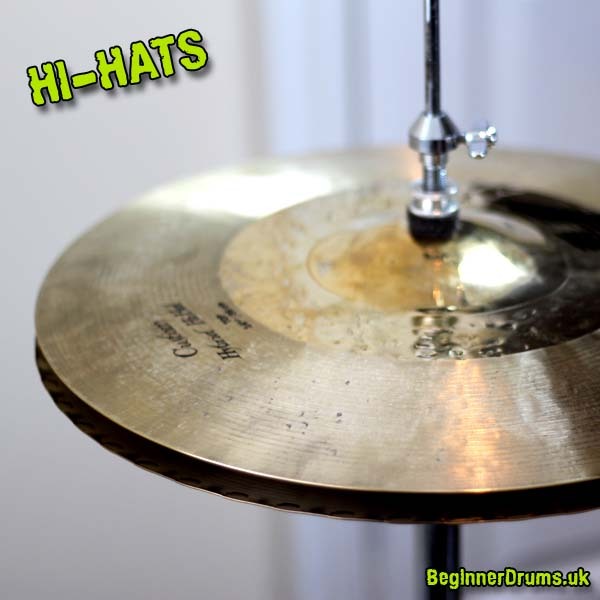 Splashing the hi-hats – this involves closing the cymbals (with your left foot) and immediately opening them again so that you hear the ‘ring’ of the cymbals. This produces a similar sound to hand operated orchestral crash cymbals. Most of the above options can be varied further by playing different parts of the cymbal – i.e. the edge, the bow or the bell. 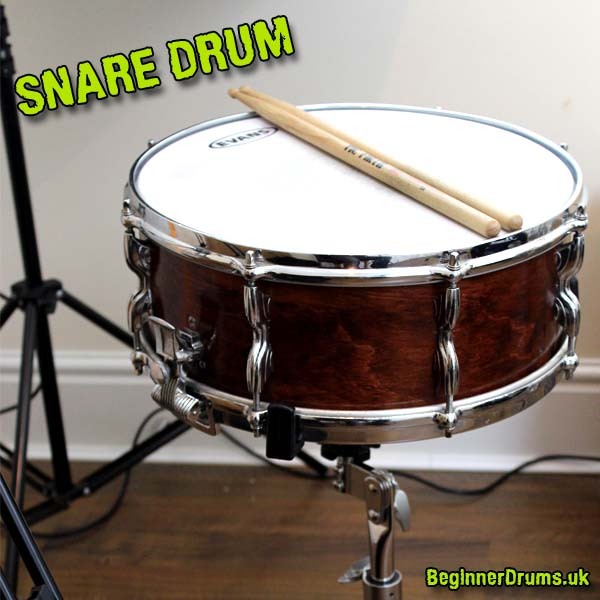 The snare drum is one of the most important drums on the kit – it forms the centre of the kit and can be played in a wide variety of ways, commonly used to play the ‘backbeat’ of a typical straight 8’s beat. The drum is normally 14″ in diameter and 6″ in depth but is available in a wide range of other sizes. The drum consists on a wooden or metal shell and it will always have both a batter and resonant head. The resonant head has snare wires suspended under it to produce the classic snare ‘buzz’ sound – the mechanism used to attach the snare wires to the drum is called the snare strainer. The snare strainer mechanism normal also includes a ‘throw off’ to switch the snares on and off and an adjustment thumb-screw to adjust the tightness of the snare wires. The snare drum sits on a special snare drum stand consisting of legs and a 3 arm basket to hold the drum. Tom toms or ‘toms’ as they’re more commonly known come in a wide range of sizes. Common shell sizes on a fusion kit are 10″, 12″ & 14″, common shell sizes on a rock kit are 12″, 13″ & 16″. On a 5 piece kit you will have a high tom, mid tom and low / floor tom. The low tom will either be ‘mounted’ (normally on a ‘fusion’ kit) – i.e. attached with a clamp to a cymbal stand, or it will be a floor tom (normally on a ‘rock’ kit) – i.e. it sits independently on its own 3 legs. 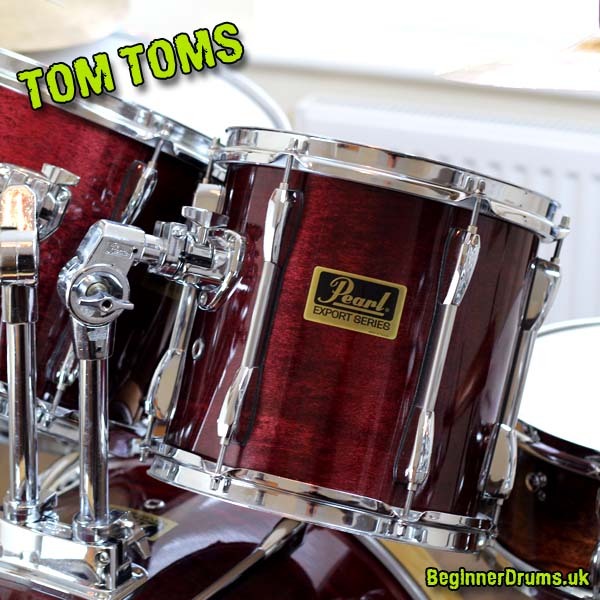 Toms normally have a batter and resonant head but the resonant head isn’t mandatory. There are a variety of clamping mechanisms for the high / mid toms – most commonly they’ll attach to tom arms that in turn attach to the bass drum. Another option for the toms to be clamped to cymbal stands. The ride cymbal is a larger cymbal (20″ is a fairly typical size) that generally sits on the right hand side of the drum kit. It’s normally a heavier cymbal played with the tip of the drum stick to produce that distinctive ride ‘ping’ sound. For a more defined ping sound you can also play the bell of the cymbal using either the tip of the stick or the shoulder of the stick for an even louder ping sound. A general rule of thumb with ride cymbals is not to crash them unless they’re designed as ‘crash/ ride’ cymbals. Crashing a normal ride cymbal can result in damage and it also probably won’t sound particularly good. Crash cymbals are generally a bit smaller than ride cymbals – a typical size being 16″. They’re designed to be hit quite hard with a glancing blow from the shoulder of the stick. 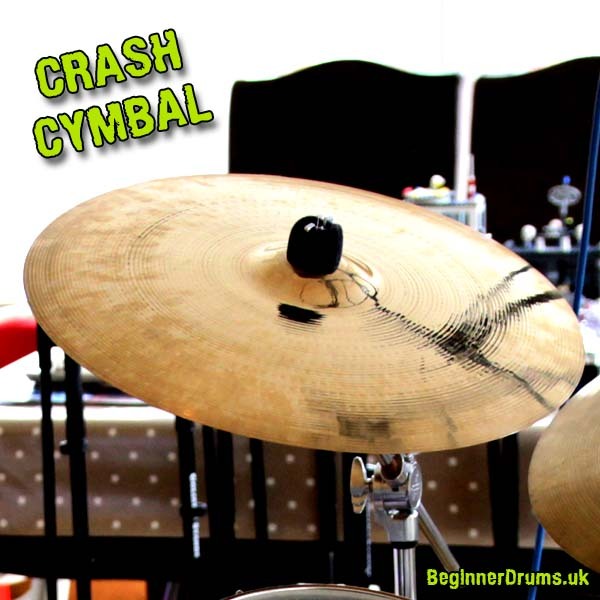 Normally crashes are used as accent notes, for example at the end of a fill, however you can also ‘ride’ the crash, playing powerful rhythmic patterns similar to what would be played on the hi-hats or ride cymbal. It’s very common in rock music to ride the crash in particularly loud parts of the song – have a listen to The Pretender by the Foo Fighters where Taylor Hawkins switches between riding the ride and riding the crash during the choruses (4 bars of ride, 4 bars of riding the crash etc.). It’s quite common to have several crash cymbals around the drum kit in a variety of sizes. Generally speaking larger cymbals will have a louder sound and longer sustain whereas smaller crash cymbals will be quieter with a shorter sustain. Having a choice of crash cymbals is both convenient, in terms of having one near to the last drum you played and also allows the player to develop a richer and more varied sonic palette. For example, if a fill calls for two crashes in short succession it often sounds better for these to be played on two different cymbals. The above describes a fairly basic 5 piece drum kit but after you’ve been playing a while you’ll probably want to upgrade and add-on to what you’ve got. What you add is completely up to you and largely dependent on the sort of music you play. If I list every item of percussion that can be included as part of a drum kit this page would never end, but here are a few common ‘extras’ that you might want to consider. 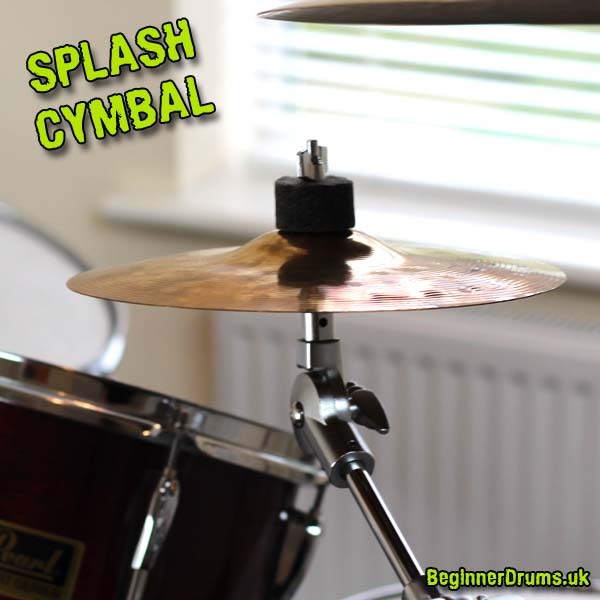 A splash cymbal is essentially a very small crash cymbal. A typical size is 8″ but they’re available in a range of sizes and variations to give extra texture to your playing. A splash is great to use as a subtle accent cymbal and because they’re small they can fit in places where other cymbals can’t! Have a listen to The Sound of Muzak by Porcupine Tree where Gavin Harrison makes great use of the splash to add texture to the beat in the early part of the song. Splash cymbals are used creatively throughout this song. 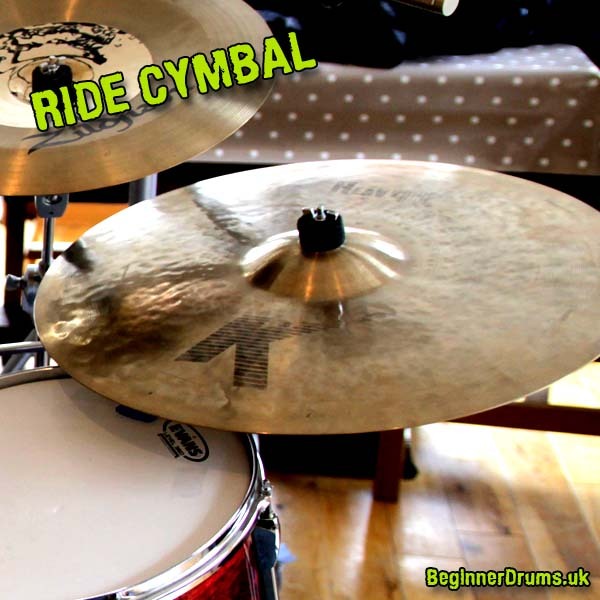 A crash / ride is often considered as a cheap alternative to separate crash and ride cymbals but that’s not necessarily the case and don’t dismiss them! There are some great crash / rides out there that make both a very good ride cymbal and a very good crash cymbal – and of course you only have to carry around one cymbal! 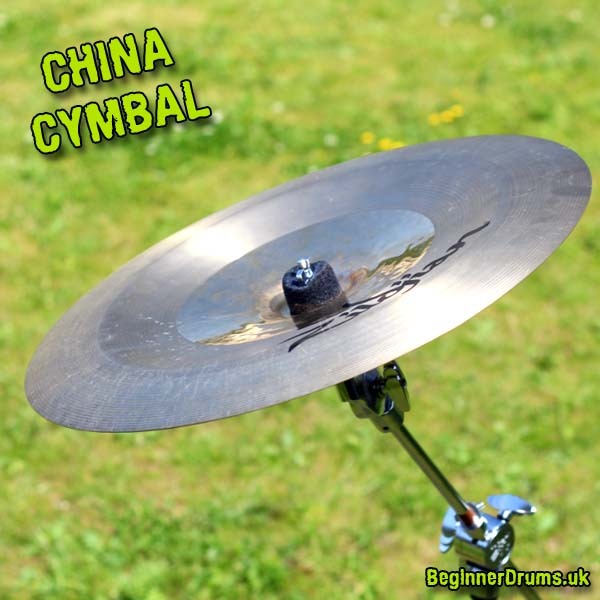 A China or Chinese cymbal is a great addition to any drum kit. The cymbal has an up-turned edge and is often mounted upside down so that the shoulder of the stick hits the bow of the up-turned edge, producing a very distinctive trashy-crash sound. Listen to the bridge / harmonica solos in Baggy Trousers by Madness where a single China hit in bars 4 & 6 gives that whole section of the song such a distinctive sound. There’s always room for more cowbell in a song! A cowbell is a metal percussion instrument very commonly used in Latin-American music but also makes regular appearances in rock / pop music. Have a listen to the classic Nightrain by Guns N’ Roses with the late great Steve Adler on drums. The cowbell is typically mounted on the hoop of the bass drum to the right of the snare, although personally I advise against this as invariably it damages your bass drum hoop. I prefer to mount it to a cymbal stand using clamps. 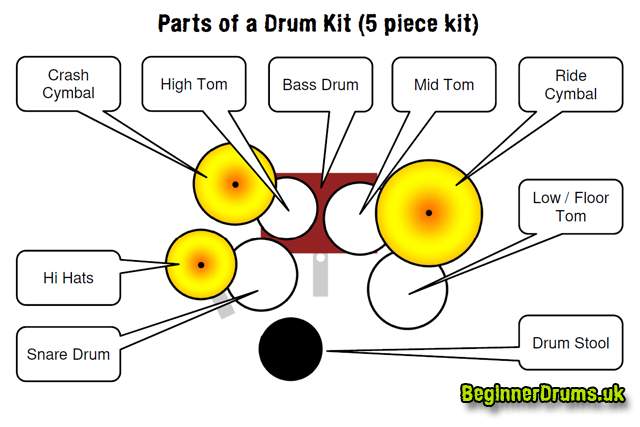 This sheet shows you a simple top-down view of a drum kit so you know what’s what! This version is fairly basic and just shows key elements such as snare, hi hat, ride etc. in a standard 5 piece set-up (right handed configuration). Can also be handy so you know what goes where when you’re setting your kit up.